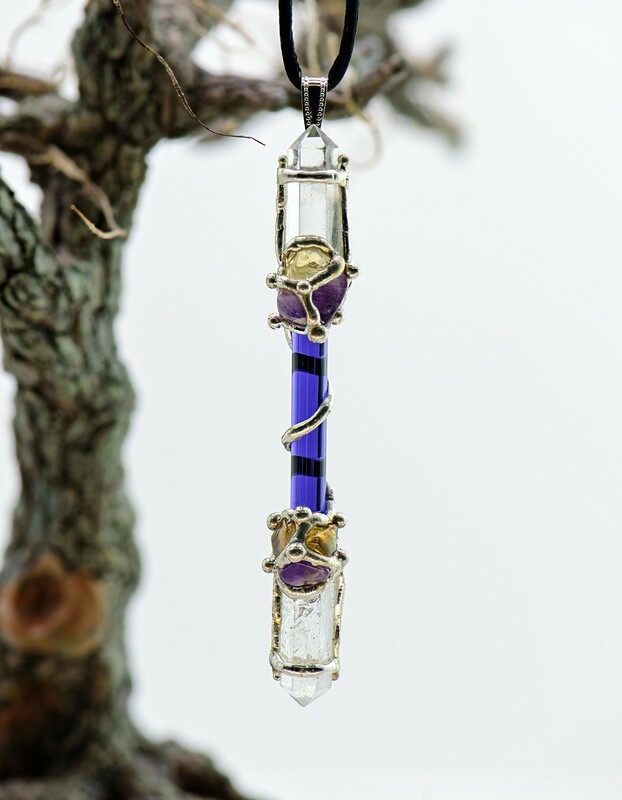 This amulet is a hand-crafted mystical amulet for the Archangel Uriel. He is known as "God's Light". He embodies problem-solving, creativity, learning, peace and service. Amethyst symbolizes piety, humility, sincerity and spiritual wisdom. Amethyst is a highly spiritual stone connection earth with heaven. Citrine increases self-esteem, protects from negatie energy, opens the mind to new thoughts, and promotes clarity of thought. We have cast this amulet with enchantments to guide you to accepting true peace and tranquility from within your soul, opening your mind to new ideas, and expanding your ethereal power. This spell creates a deep and profound connection to the Astral Realm; allowing you to hear, feel and engage the Archangel Uriel with power within. Vessel is hand-crafted amulet from Seeds of Light. Be aware these amulets are handmade and each amulet varies slightly in gemstone size, shape & color. Each amulet contains all the stones, energy & magick as described above.